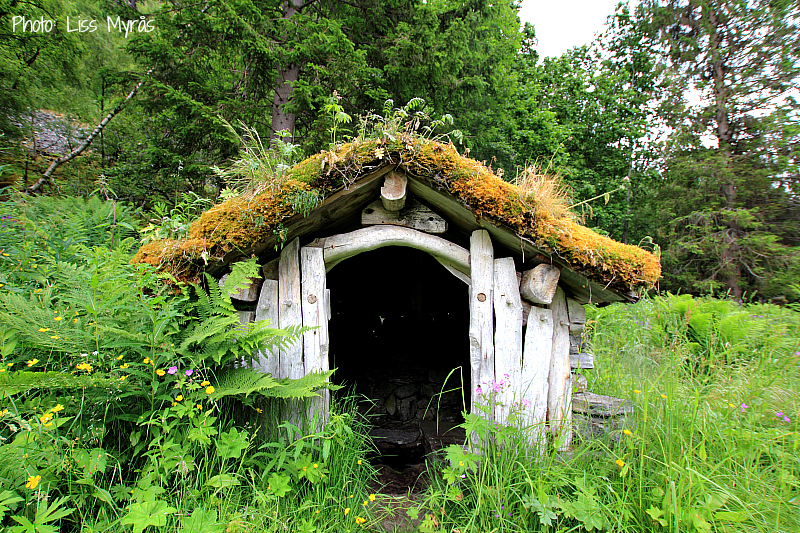 Our Norwegian Queen adores this place – and now I understand why. The hike started when I jumped off the shuttle boat at Skagehola and more than 130 tourists gathered in the front to wave me goodbye. 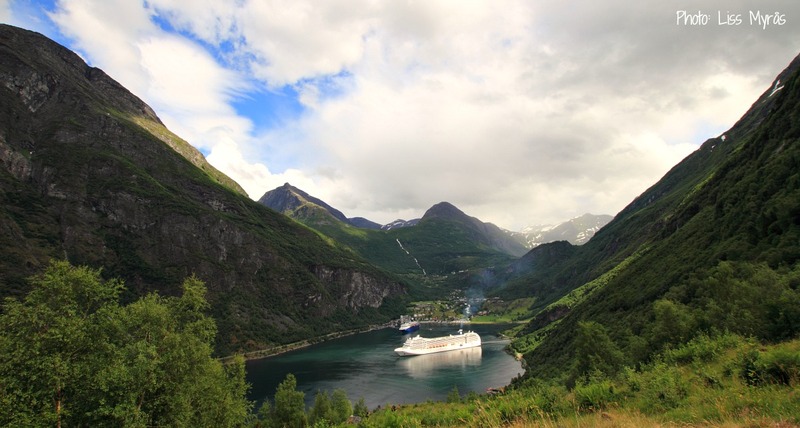 I was the only one to disembark, and they probably wondered where the heck I was going as there’s nothing more but som greenery, rocks and a steep high mountain wall to see there. To continue the hike you know you have to go out and round it – hold a hand on the wire, place your feet nice and calm on the trail and you will be just fine – if I can, you can too! And then you see it… the trail pops out of the first greenery at the foot of the mountain and clings itself upwards the rock face. Here and there you see a glimpse of some safety wires that hints about the possibility to get up here. I was just hoping it wouldn’t start raining resulting in a too exciting and slippery adventure. It took me 30-45 minutes to get up to first stop Skageflå fjord farm, it depends on your condition, how much you want to enjoy the view and of course photographing. The first part is steeper “rock stairs” with iron fences, higher up you will have to rely mostly on wires at the most exposed/airy parts… that’s also the parts where my “ascending style” became much less elegant, so to speak ..ha…ha. 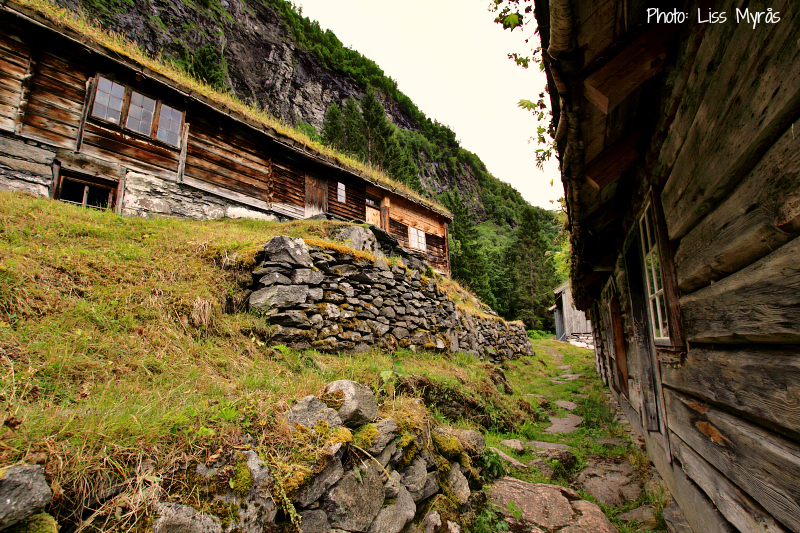 Skageflå fjord farm was one of the richest goat farms back in the days, but a rock slide destroyed much of the cultivated land in 1873. 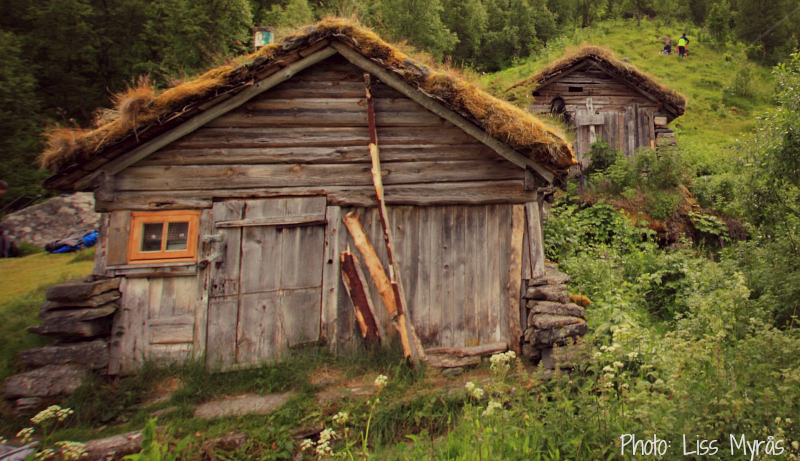 People lived here until 1916, when the farm was abandoned. 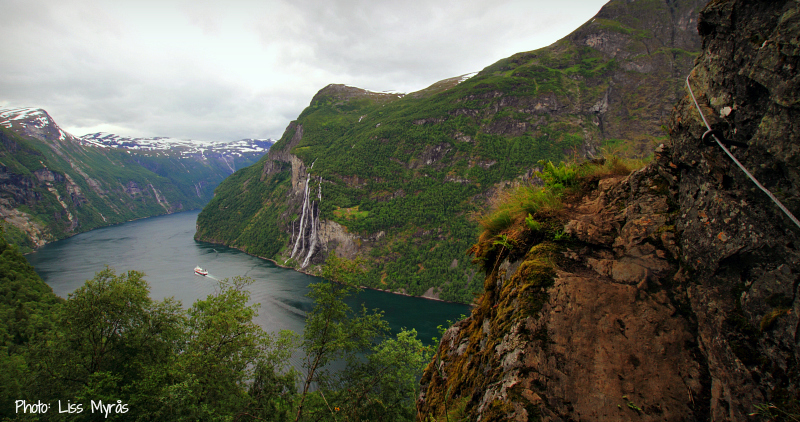 The hike continued from Skageflå (250 masl) upwards to the fjord farm Homlongsætra (544 masl) through steep trails through some greenery and some exposed/airy wired parts on the rock face. But hey…don’t forget to actually enjoy the view too… it really IS breathtaking… don’t just hurry upwards or cling to a fence or a tree ..ha..ha.. find a spot where you feel safe and take in the view. 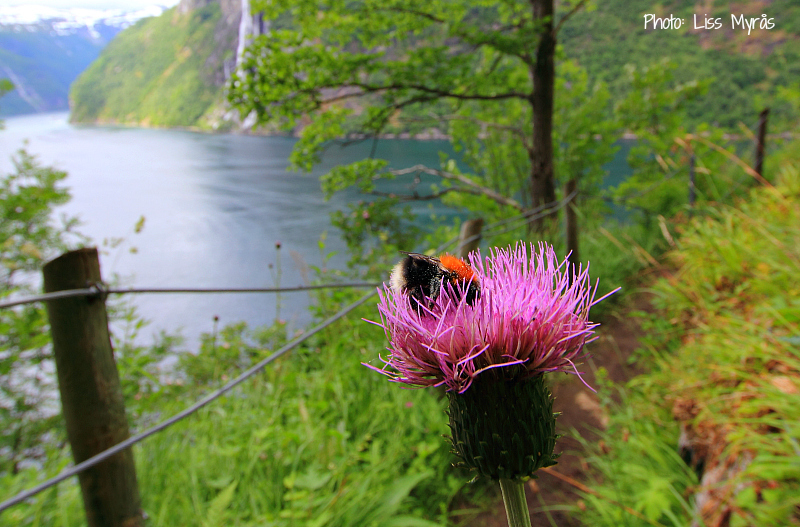 At Homlongsætra fjord farm you can fill your water bottle from a fresh mountain stream and enjoy a fab view towards the Eagle Road on the other side of the fjord. 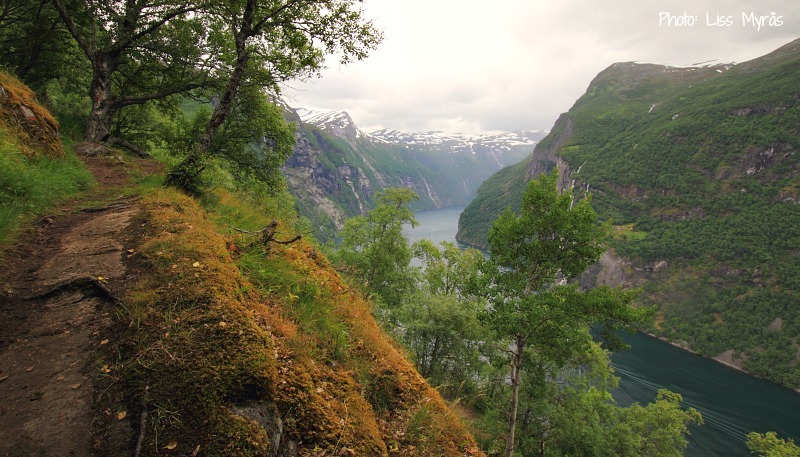 From this farm a much easier and milder “forest trail” continues downwards along the edge all the way back to Homlong …and finally Geiranger. 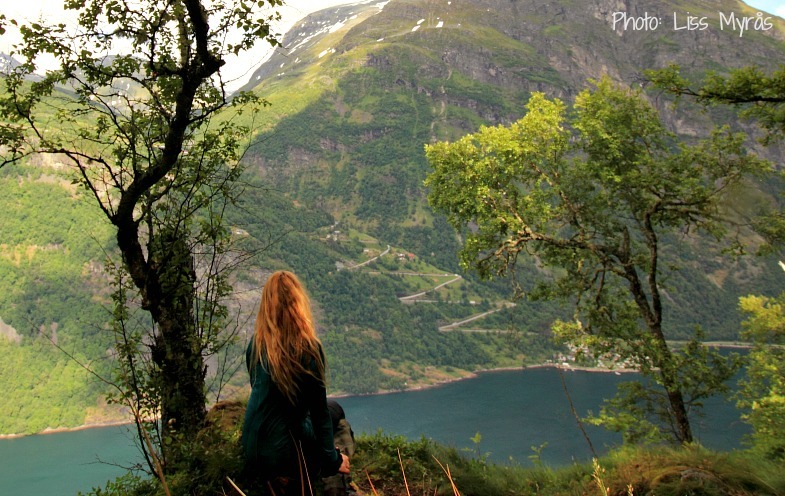 Hiking down from Homlongsætra you will have a first class view towards the famous Eagle Road ( Ørnevegen). 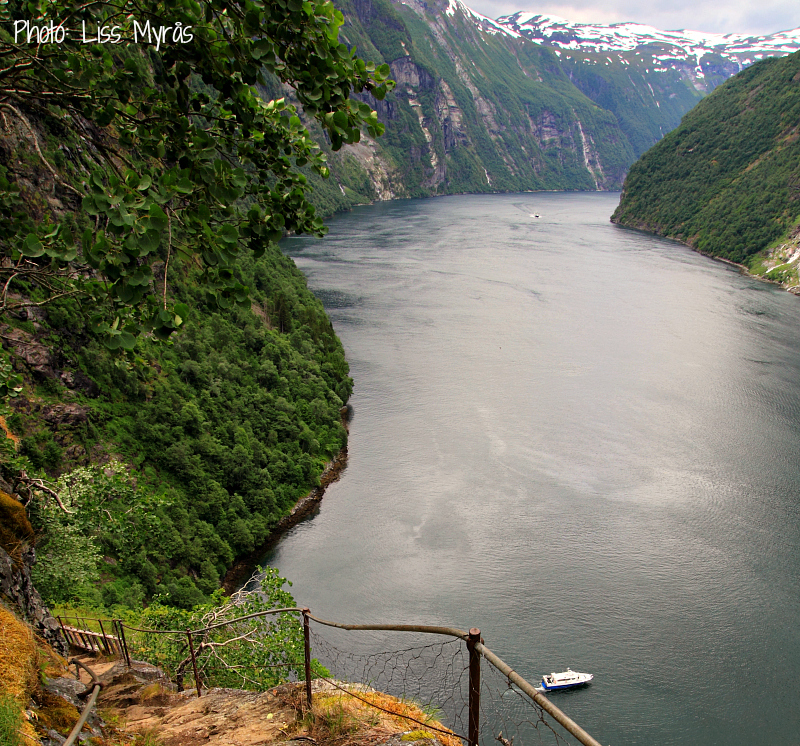 Everyon that have visited Ørnesvingen over there know it looks on this side beneath me on this picture – a sheer drop all the way down to the fjord… joodelii-hii-hoo..
One of the last peaceful and panoramic places on your way down from Homlongætra. 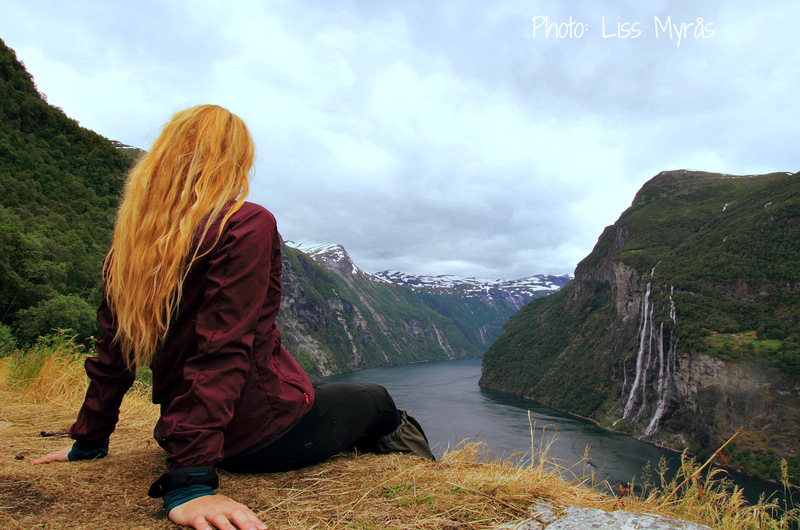 Enjoy a rest/meal and the panoramic view of Geiranger surroundings before you walk the last piece on the gravel road into the hectic centre for a chilled cider. 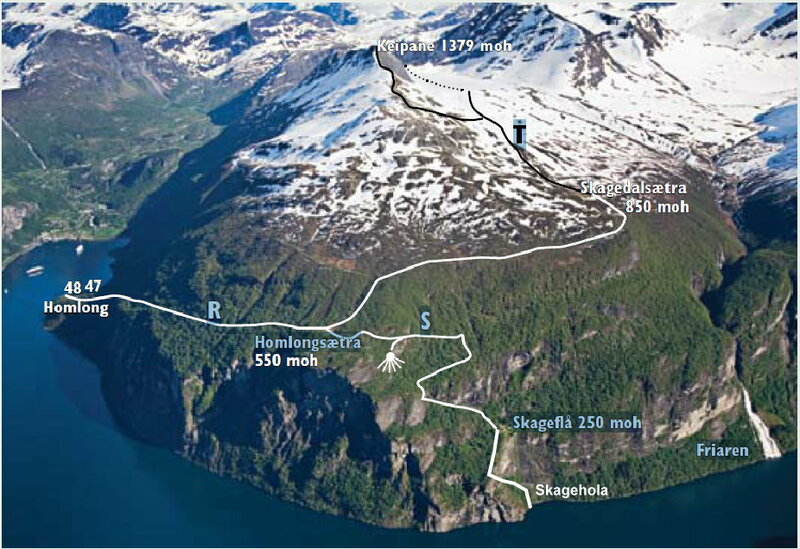 I have borrowed this overview picture from Camptocamp.org to show you the trail all the way from Skagehola to Homlong ..and Geiranger. If you choose to do the opposite way you will get a steeper and more visual exposed feeling – not recommended for those with fear of heights. It is easier to go up than down. Hi Liss. Thanks for sharing this outstanding hike. I had heard about Skageflå but never seen the shelf for real. I know about the tax collector and the ladder, which was drawn up before his eyes when he came to collect … and the kids who got tied a rope around their waist, so they didn’t fall too far.